Vanish, the Reckitt Benckiser-owned cleaning brand, has created the "world's biggest bra" to raise the profile of Breast Cancer Awareness Month. The bra has been rigged up on the ITV Southbank building and will be unveiled today (28 October) on 'This Morning' by 'Hollyoaks' actress Gemma Merna. 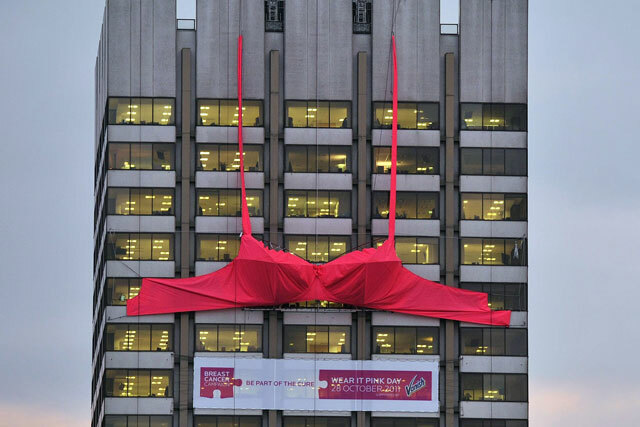 The bra, created by marketing agency Chillisauce, took four weeks to make and measures 31 metres around the "chest". It has been named the biggest bra in the world by the Guinness Book of Records. Stefan Gaa, marketing director of RB UK, said Vanish is "very proud" to be supporting "wear it pink" day, which it will be supporting through on-pack and Facebook activity. He said: "This is an issue that affects so many women and their families and Campaign are doing a vital job in raising funds for research and keeping breast cancer high profile. "The Vanish and Breast Cancer Campaign record breaking bra is a fitting focal point for this year's fundraising activities." 'Wear it Pink' raised £2.5m for breast cancer last year by getting thousands of people to wear a pink item of clothing and donate £2 to the charity. Last month, Beta released a campaign for the British Skin Foundation to raise awareness about skin conditions.